We started our week off by taking Lydia down for the Quarterhorse Congress in Columbus Ohio. This is the second time she has competed in the EWD class there. She has grown a lot since that first time two years ago. She participated in 3 classes, Trail, Horsemanship and Pleasure. We splurged and bought her a new vest from one of the booths. She felt so glamourous. I caught a little sparkle in the sunlight while she was in the practice arena. She's right in the middle of the picture. It was exhausting day...but everyone survived. And then we booked it home because Monday was a full day as usual. Lydia takes a class at the stable on Monday mornings. This month her class is on Equine Employment. So she had to be at the stable, and we also had Geography Fair. Caty did the country of Georgia. Lydia missed giving a presentation because she had horse class. But we still displayed her poster. Then we went home to work on some school work and crash for a few hours after getting in so late from Congress and needing to be up so early for all the running. But we had plans to go to the new light exhibit at our local zoo with friends. So it was a brief rest. The light show was pretty. Brayden had a really good time. He actually crawled into a little hangout from when he was little with Caty. This week we also had eye checkups for the entire family. We are very fortunate to have such a great eye doctor that also checks for others possible learning disabilities for us. He does such a thorough check of your eyes with pictures and screening. It's not just about basic sight, but also eye health. Thanks to his diligence, he discovered a possible condition in Caty's eyes that may be explaining some of her learning struggles. So we are now on watch with her eyes. She will be in glasses now for everything but play. Lydia still has some issues with eye muscles that we must continue to address. So she got a new script, and fortunately has graduated away from the special prism in her lens for right now. Doing schoolwork in the waiting room. The keyboard I treated myself to for my iPad has come in handy quite often!! Random shot of Brayden working on his math. He comes out to get me when he doesn't totally understand the video lesson. He's using CTCmath.com. Caty finished up Life of Fred Edgewood this week. We started playing the card game they mentioned in there. I splurged and purchased the Scholastic News classroom mag subscriptions for Caty and Lydia. We got all of Septembers in at the same time. So the girls spent this week trying to catch up back issues. Lydia started a new class at Innovators Tribe. It's an online Engineering class. Almost every lesson has a challenge that the kids needs to work through. This week she had to build a tower with 4 sheets of paper and 12 inches of masking tape and make it as tall as she could. She got to 36 inches. Her other assignment was to build a shelf to hold books off the table 1 inch. Lydia was using Drawing Through History, but she really didn't like it. She kept eyeing Caty's Draw Write Now books. Trouble... Lydia is working on perfecting her cursive. So I went through and wrote the lessons in cursive in Lydia's book. She was a happy camper. Guess that's one more step in prepping weekly lessons now. Working on his CTCMath out and about running errands. We had to pick Lydia up from work. She was taking the horse out for grass since the horse wasn't feeling well. Brayden has been dying for the new Super NES game retro game system that was released a couple months ago. Every once in a while I was checking around, but Brayden was searching more. I was out running errands and he asked if I could call the local Game Stop. They didn't have any that day, but said they had a limited supply the next morning. So Brayden asked me to take him over and wait for the store to open. It's a good thing we did go over early. They only had two systems and 3 wireless controllers!! I told him he had to wait in the cold for it. I sat in the truck and watched him to make sure he was safe. He was one excited boy!! The milkshakes were a success! The day he got the NES system, he knew he had to come home to do his school work. He was chomping at the bit all day waiting for his sisters to finish their schoolwork (since they were in the living room). He finally got to hook it up and was in love! The girls and I went out to watch part of the meteor storm. It was 3 am and we were cold. But I made them hot chocolate. We saw a few streaks and after freezing for 45 minutes we came back inside. It was a fun experience and we were able to tease Caty a bit about falling asleep in the driveway. This was our science experiment from a couple weeks ago. They planted some bird seed in shallow dirt, it took a couple weeks to see the results. This experiment was meant to simulate the frozen tundra and how plants have a shallow root system. Once the roots hit the frozen ground, they have to spread out. 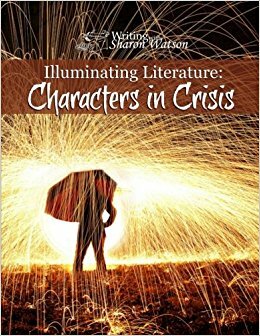 Joey started a new Literature series this week from Writing with Sharon Watson... Illuminating Literature: Characters in Crisis. This week he and I learned a lot about the various characters beyond the terms main and supporting. I am doing this with him, since I want to make sure that he is grasping the material (and actually doing the work). So I am reading and working along with him. In History this week, the girls started studying about Moses and the Israelites. It has been a great learning experience this week. We have been able to refer back to this part of history several times in our daily scripture text and even our Bible study in the Watchtower this week. To go with their study, they also watched an animated movie on Moses and the Ten Commandments. We also read the lesson on the Spartans and the Trojan War. We didn't have Science Club because of illnesses, but the girls continued doing their Internet scavenger hunts I found on Teacher Pay Teachers. They finished up the biomes of the world and also learned more about Food Chains. It was a week of Wild Kratts and Magic School Bus (both old and new). I did let them watch a lot of Magic School Bus when working on their handwriting and other lighter subjects. Joe bought a Firestick from Amazon this week. One of the channels we could watch was Channel 1 student news. The girls seems to like it better than CNN10. The boys prefer that. So I told the boys they could continue to watch CNN 10, and the girls could watch Channel 1 Student news. We watched it every morning after we do our morning scripture and prayer together. Have you seen the new Magic School Bus show on Netflix? What are your thoughts? At first the girls were a little freaked out, but now they really like it. So I figure we'll be using this program a lot for filler on days I need a little break. I hope everyone had a great week!! Linking up with other Homeschool Moms at Weird Unsocialized Homeschooler. It looks like a great week. The Scholastic New looks great. Did you have to buy 10 copies or is there a way to just buy one? I would love to do the life skills one. Wow! That's a lot of great stuff in one week! And congrats to Lydia!!! That light show looks gorgeous!